Dashcam Viewer 3.0 is now available for download from our website. Although you might not initially notice any difference in outward appearance, Dashcam Viewer 3 is a major internal upgrade from version 2. Improvements include picture-in-picture (PiP) support on the Windows version, use of new video playback backends for both Mac and Windows versions, and adoption of a more modern web framework for the Map views. These changes result in better performance and modernization of the software. PiP is now available on Windows version. Video playback performance is improved. Note: you must now install a codec pack to take advantage of video playback. DCV3 will direct you to the K-lite codec pack URL when you run it for the first time. The occasional black screen issue is largely improved. Max accelerated playback speed increased from 2x to 5x. Vehicle position and route now display correctly in Google Maps option. Added support for Vantrue N2 Pro dashcam. Fixed issue where using the mouse to zoom in the video would not work even if the mouse was in the movie frame window. DCV3 no longer shows the annoying ‘A movie must be playing..’ error message. Minor bug fixes to Movies and Geotags Window, Dashboard display. The Export Movie window will now disappear after a movie clip is exported. In Movies and Geotags Window, the currently-playing movie is highlighted in a brighter color. Improved filtering of bad points in Viofo A119 series. Fixed bug in processing GPS data for SONY AS100V. This is a free upgrade for version 1 and 2 users. macOS 10.10 is now the minimum system requirement. On the Mac version, you may occasionally notice the video will appear zoomed-in when first loaded. If this happens, double-click in the movie window to properly size the movie for the window frame. This seems to be a glitch in the video backend framework. DJI’s ‘SRT’ files are no longer processed in DCV3. This capability is being moved to a new product called DroneViewer. DroneViewer will be a fork of DCV3 and evolve to have UAV-specific features. Due to the amount of source code changes in version 3.0.0, there are bound to be some bugs and quirks. Please email me with any significant issues and I will address these as fast as I can. Dashcam Viewer is PC/Mac software that allows you to playback your dashcam’s videos while simultaneously viewing your vehicle’s location on a map. 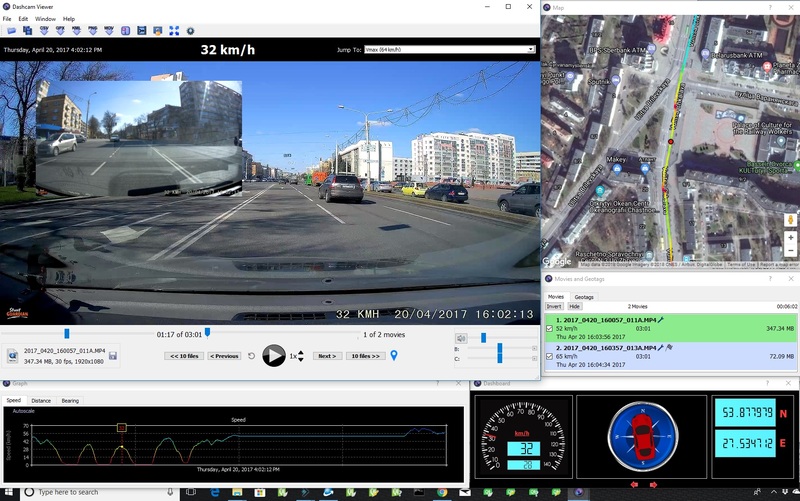 There are many other features in the software which are detailed on our website (http://dashcamviewer.com). The free version is fully-functional and allows the loading of up to 5 videos at a time.